Since the launch of our Facebook and Twitter pages in 2009, I’ve really tried to engage and educate our audience on a daily basis by publishing the latest news and events, creating polls, uploading service line videos, creating photo albums and publishing patient testimonials. Basically, I’ve tried to mirror everything that’s on our website, while at the same time, trying to shine a bigger spotlight on our doctors and nurses. The feedback has been positive, but I realize there are several other untapped platforms, including Google+ hangouts and Pinterest. We recently unveiled a digital communications platform throughout the hospital. Strategically placed in our cafeteria, West Outpatient and ICU, these TV screens allow me to customize slides directly from my computer and publish content in real-time. I feel this platform is very effective because we’re reaching multiple audiences with the added ability to embed videos, publish our ER wait times and promote our YouTube channel as well as our Facebook and Twitter pages. We hope to install several more screens in our physician lounges, main lobby and several other waiting areas. In addition to the monthly print newsletter I produce for our employees and physicians, I also produce quarterly e-mail newsletters focusing on several major service lines of the hospital. Included within these e-mail newsletters are staff profiles, updates on clinical trials, a personal message from the department director and physician profiles highlighting specialty procedures they perform. With assistance from an outside vendor, we’ve produced promotional videos with patient testimonials for nearly all of our service lines. All of these videos are stored on our YouTube channel, which we’re able cross-promote through various internal and external outlets. In 2012 I may opt for the inexpensive route and simply shoot short videos from my iPhone camera, highlighting staff from a different department each month and posting it to our Facebook page. Lastly, I like the face-to-face communication tip. Our CEO holds town hall meetings a few times a year, and it may be another opportunity to engage the audience with the hospital’s digital communications and social media efforts. I love watching these two play, but I hope we haven’t seen the last of Roger Federer. Well, it’s official. The Kansas City Chiefs have hired Romeo Crennel as its head coach. Maintaining Romeo is a great move because the team can build upon the success it achieved during his three-game stint as interim coach, and it eliminates all distractions as the team enters the offseason. 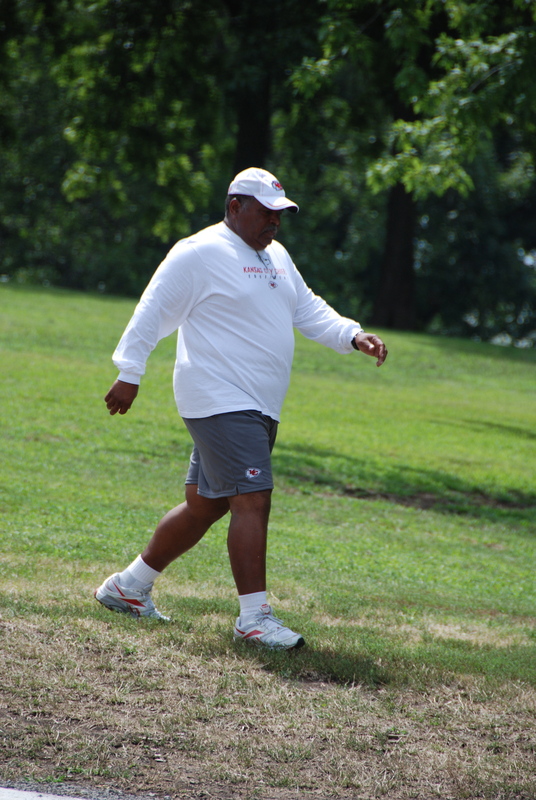 Crennel is a brilliant defensive coordinator so I’m hoping he maintains this role. The Chiefs now must find an offensive coordinator who’s not afraid to stretch the field and create bigger plays for the quarterback and our running backs, similar to what Charlie Weis did during his time here. I would welcome the addition of Mike Mularkey or Marty Mornhinweg to the Chiefs staff. Both are proven offensive coordinators who currently lead potent offenses for the Atlanta Falcons and Philadelphia Eagles respectively. The Maze Runner was a fun read! Vivid descriptions of the Runners sprinting through the Maze fighting monsters, discovering secret passageways and trying to decipher secret codes, was reminiscent of scenes from Lost. I’m really looking forward to continuing the journey with The Scorch Trials. It’s definitely a Midwestern tendency to not brag about one’s accomplishments, but if I were to look back on my professional career to date, I’d say my biggest highlight was when I received the 2007 Bill DeLay Award for Distinguished Service to the Greater Kansas City PRSA Chapter. Working in the non-profit world for nearly 10 years and looking to expand my networking base, a colleague of mine suggested I join the local PRSA chapter. After attending one of the Chapter’s monthly professional development luncheons, I immediately volunteered for the PRISM Awards Committee and soon after accepted the role of volunteer website manager. I remained website manager for nearly five years, working with an outside agency to produce a new website and Intranet portal for select Chapter members. I was also elected to serve on the Board of Directors as VP, Communications, in 2007 and 2008. During the Chapter’s annual PRISM Award ceremony, after all of the category winners receive their PRISM and Silver awards, they announce and present three special awards (Roger Yarrington PR Professional of the Year, Best of Show and Bill DeLay Award for Distinguished Service) at the end of the program. The awards are much anticipated and a complete surprise to the recipients. In my case, it’s also a little embarrassing when the previous winner prepares a lengthy speech highlighting my accomplishments in a packed banquet room of nearly 500 attendees. In the end, it was truly a honor to be recognized that night. Another highlight is winning the 2009 Missouri Hospital Association Show-Me Excellence Award. 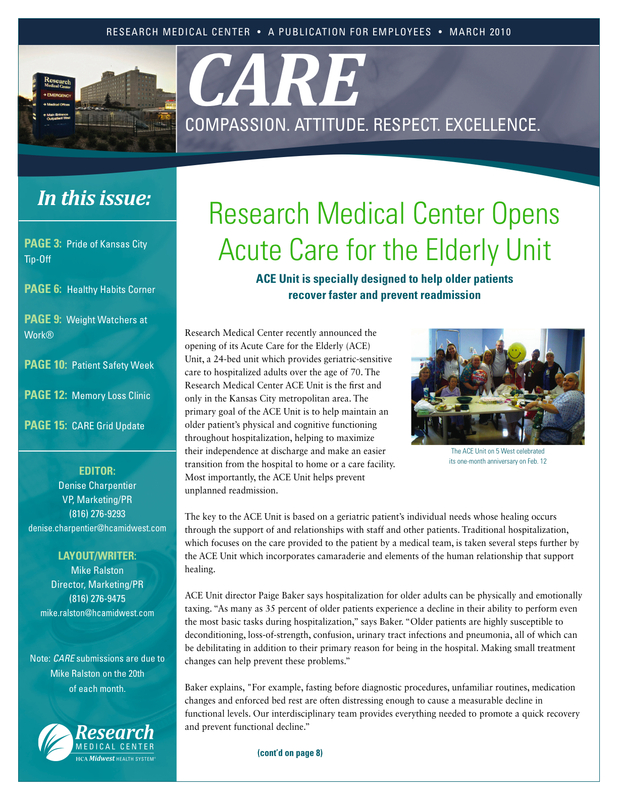 I received a first place award for CARE, an internal monthly newsletter I produce for the employees and physicians at Research Medical Center, a 511-bed acute-care hospital located in Kansas City, Mo. The CARE entry and my email newsletter campaign also was recognized by the Greater Kansas City PRSA Chapter and Kansas Hospital Association. 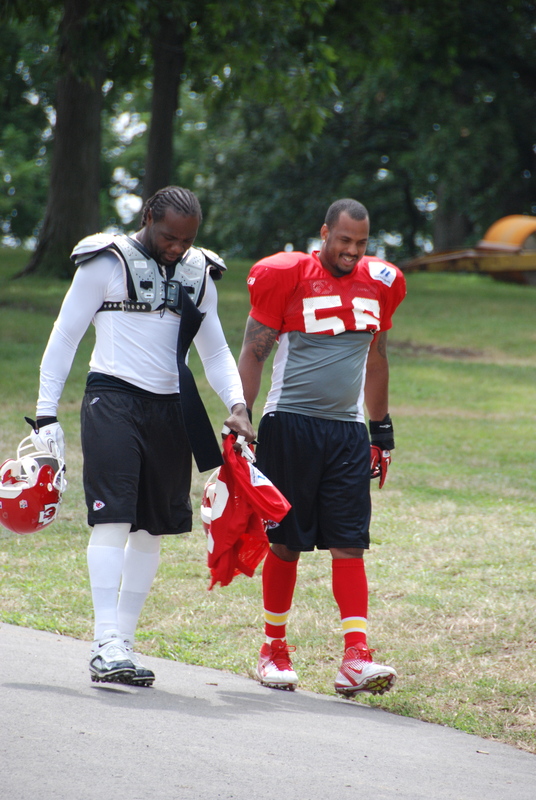 Congratulations to Derrick Johnson and Tamba Hali on their selection to the 2012 AFC Pro Bowl Roster. It’s a shame Brandon Flowers wasn’t selected because he was deserving of a roster spot too. Below is a photo I took of Johnson and Hali at this year’s training camp in St. Joseph, Mo. 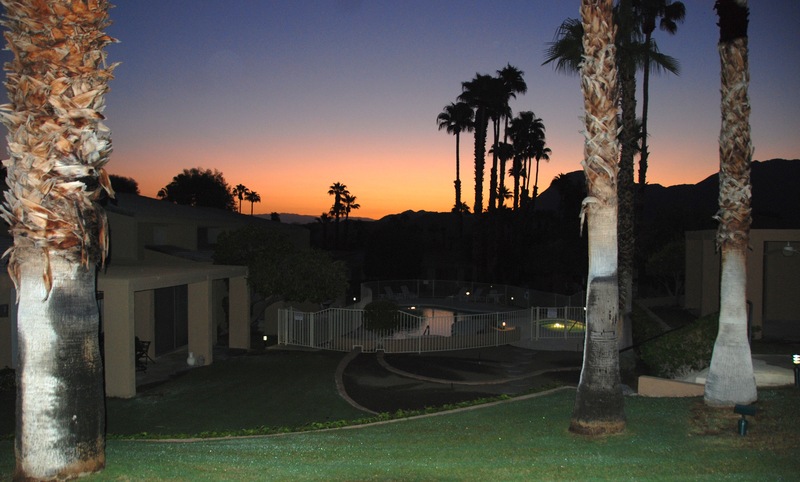 I just returned from an unbelievable vacation in Palm Desert, CA.